The following article appeared in the Virginia Pilot December 24th and was written by Victoria Bourne. Photos were taken by Stephen Katz. 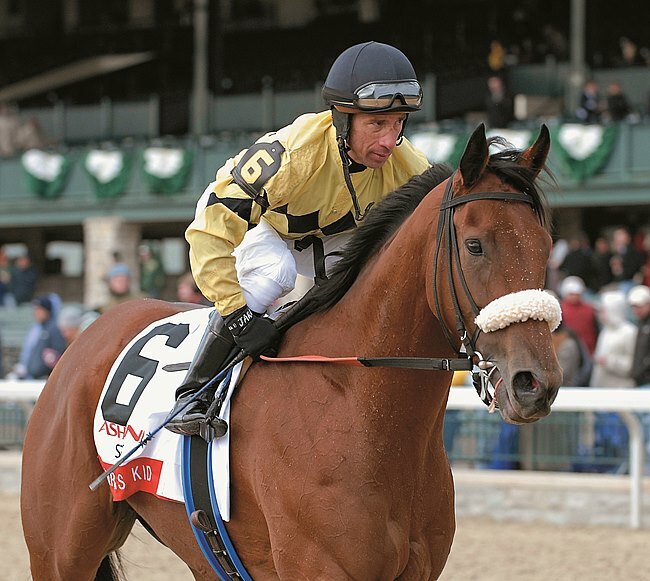 The following appeared in Bloodhorse.com and takes a look back 10 years ago at a Virginia-bred named Christmas Kid. Christmas Kid won the 2007 Ashland Stakes. Christmas Kid is shown after winning the Ashland Stakes in 2007. Greyvitos may have captured headlines with his big stakes win Sunday in Remington Park’s $400,000 Springboard Mile Stakes, but other Virginia-breds scored nice wins recently including River Deep, Bird Call and Swordfish. The following appeared in The Paulick Report December 18th. Handling the outside, number 12 post in the $402,400 Springboard Mile was easy for winner Greyvitos, considering everything the colt has been through in the past two weeks. 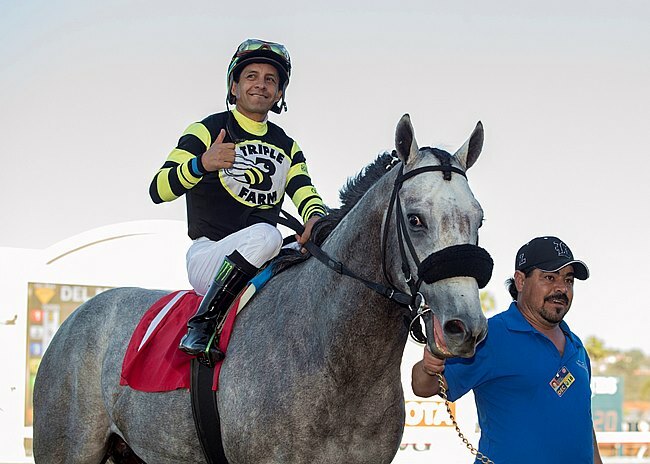 The gray opened up to win Remington Park’s top race for 2-year-olds by 2-1/4 lengths under National Racing Hall of Fame jockey Victor Espinoza. The following appeared in Bloodhorse.com December 14th. The following sappearedSurvivor of San Luis Rey fire carries hopes for connections in one-mile test. 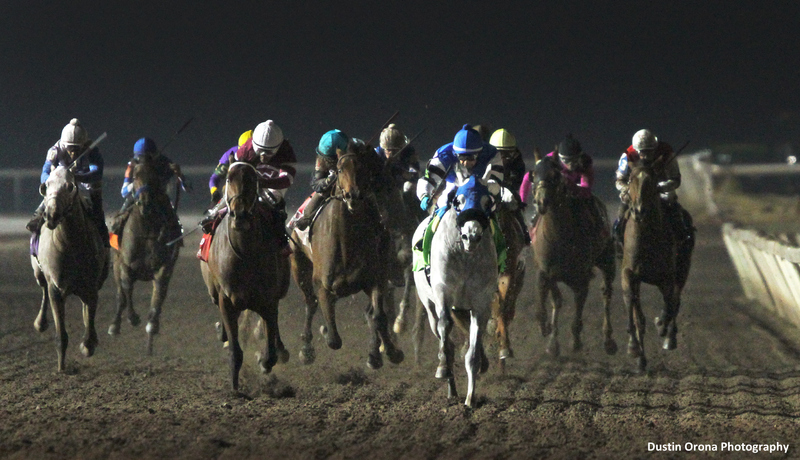 Virginia-bred Greyvitos will compete in Sunday’s Springboard Mile at Remington Park. You go on because that is what life dictates. Four Virginia-breds reached the winners circle this past week including Galaxy Express and Wing Fighter, a pair bred by Lady Olivia at North Cliff. The following appeared in The Martinsville Bulletin November 30th. COLLINSVILLE-Off-track betting will soon arrive at Collinsville’s Dutch Inn. On Wednesday, the Henry County Board of Zoning Appeals (BZA) granted a special use permit to the hotel, which will allow for off-track betting – state-sanctioned satellite wagering on horse racing – at the hotel’s restaurant and bar. Congratulations to trainer Jonathan Thomas and Catholic Boy, who prevailed in the Grade 2 Remsen Stakes December 2nd at Aqueduct. Jonathan is the son of Virginia Equine Alliance (VEA) Track Superintendent John Dale Thomas. 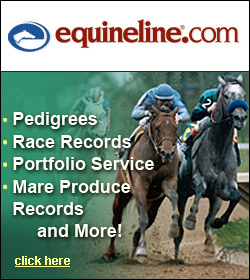 The following piece appeared in bloodhorse.com.